One of the most elegant, the only boutique hotel in Vung Tau located in the central of the city, next to the shopping and entertainment area, easy reach to the beach, specially, just 5 minutes walking to LAMSON stadium to enjoy greyhound racing. 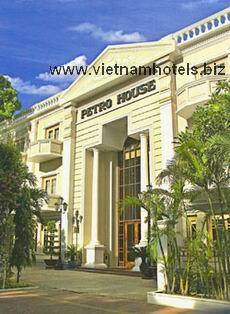 Furnished in the colonial style, the Petro House Hotel offers 75 comfortable rooms, suites and fullyserviced apartment, complete with modern facilities (business center, meeting room,swimming pool, spa,gymnasium,IDD telephone, satellite TV...). The Hotel used to serve Mrs Vo Thi Thang chairwoman of the Vietnam National Administration of Tourism; Mr.Pete Douglas Peterson, ambassador of the USA; Mr. Tim Fisher, deputy prime minister of Australia; Mr.W.I.CHO ambassador of Korea. Restaurant, dancing, karaoke, car, cano, moto for hire.